Bellingham’s historic Hotel Laube, built in 1903, is now affordable housing for the downtown community. Walking by a homeless person on the street, how do you react? Do you feel guilt? Fear? Empathy? 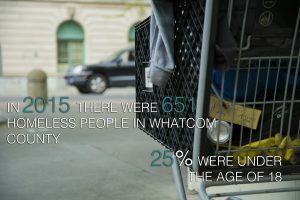 We might feel uncomfortable because we aren’t used to seeing vulnerability out in the open, says Kate Robertson of the Homeless Outreach Team, a street outreach team at the Whatcom Homeless Service Center. Bellingham is taking steps to address the needs of each person who is homeless. Whatcom County’s 2015 Point-in-Time Homeless Count recorded 651 individuals and 449 households who were homeless. Twenty-six percent of all households were chronically homeless, meaning someone had experienced repeated homelessness over three years and had a disability. People had diverse reasons for losing their home, including financial struggles, substance abuse, mental health issues, family problems and domestic abuse. While permanent housing opens up opportunities, Bellingham rents are high and vacancies low, shelters and transitional housing crowded. The city is working to make more housing available and provide resources in the mean time. Housing First is a national strategy which focuses on ending homelessness through permanent, stable housing. It recognizes that housing is a human right and need. People are housed as soon as possible and are not required to be clean and sober first, says Barbara Johnson-Vinna, housing specialist at the Whatcom County Coalition to End Homelessness. A case manager works with a person to help them maintain their housing, which may include guidance on leases, bills or who to allow into the home, and connects them with supportive services for chemical dependency, mental illness or other barriers they face. Francis Place on Cornwall Avenue., which opened summer 2015, offers permanent supportive housing for individuals experiencing chronic homelessness. “I like the change that has taken place in that housing is a right not a privilege,” Johnson-Vinna says. A safe home can improve physical and mental health, allowing people to strategize for bigger goals, she says. The Whatcom and Bellingham Housing Authorities (BHA) offer public and affordable housing to over 3,500 low-income families in Whatcom, says Tony Casale, housing programs supervisor at the BHA. Casale oversees Shelter Plus Care (housing for people with disabilities and mental illness), HOPWA (Housing Opportunities for People with AIDS), HUD-VASH (Veterans Affairs Supportive Housing) and the Housing Choice Voucher Program, a federal subsidy program that provides eligible low-income households a voucher that pays a portion of their rent. The application process to get a voucher involves two randomized lotteries. When the waitlist is open and accepting applications, an initial lottery determines who gets placed on the waitlist, and another random selection determines who receives a voucher – “a ticket to Willy Wonka’s chocolate factory,” Casale says. Some people may spend upwards of two years on the waitlist. But a ticket doesn’t guarantee housing. After receiving a voucher, individuals generally have 90 days to find an affordable place to use it, which can be tough with limited housing availability. Landlords may be unwilling to accept vouchers because of market pressures (housing programs can only pay a fixed amount to a landlord) or bad experiences with voucher holders, Casale says. Accurate information about who uses affordable housing would help eliminate stigma, he says. “It’s important for folks to realize that there is a huge segment of the population assisted in one way, shape or form,” he says. In 2012, Bellingham voters passed a housing levy to raise $21 million for affordable housing over seven years. Money goes toward housing development/preservation and supportive services for homeless individuals. Voters will decide whether to renew the measure in 2019. Long lines for permanent housing require Bellingham to invest in more immediate options, says Katie Franks, Development Specialist with the city’s Planning and Community Development Department. The city is currently working with the Lighthouse Mission to find a site for a low-barrier shelter, which would welcome individuals actively abusing drugs and alcohol (who might be turned away elsewhere), mixed-gender couples and people with pets. The city has leads on several places, she says. A shelter close to downtown jobs and services would be optimal, but the area is highly saturated, Franks says. The city is searching all of Bellingham for a site ideally close to transportation, and considering how the shelter might affect nearby neighborhoods or businesses. “It’s a real balancing act,” she says. Still, some homeless individuals might not seek out a shelter, choosing to live in their own communities outside, often due to mental illness or years living on the streets, she says. Almost every department, from planning to police, is involved in coordinating with providers. Community support can help decrease feelings of isolation, she says. The Homeless Outreach Team directs people to supportive services, shelters, medical care and helps them obtain necessary documentation—a driver’s license or state identification to get a shower pass at the YMCA, or a birth certificate to apply for social security. “Our goal is to know every single person experiencing homelessness in Bellingham by name,” says Team Lead Kate Robertson. To continue fighting homelessness, Bellingham needs to increase housing while supporting and encouraging providers, implement homelessness prevention and understand how trauma affects resiliency, she says.